See Bicycle Design for more info on this e-cargo trike. This is a press release from Pedego Europe. 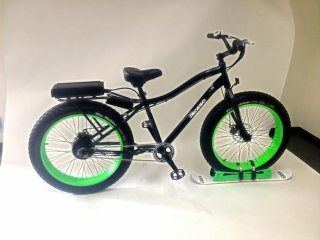 Pedego’s Trail Tracker electric ‘fat bike’ has been launched in Europe to bring off-road adventures all year round – including a unique partnership that allows it to ‘float’ on snow. The Pedego Trail Tracker can climb steep mountain trails known to defeat most regular bike riders, whether on snow, sand or stone. It is now attracting interest at ski resorts from those looking for a new kind of winter fun.